After last week Scandal tried to drum up interest in the show by stressing the fact that Lena Dunham would be guest starring, they actually received their lowest ratings of the season for that episode (and for this week, the ratings were even a little lower). So, in order to try a new tactic, they appealed to people who have been watching this show for a long time and had questions, like myself. 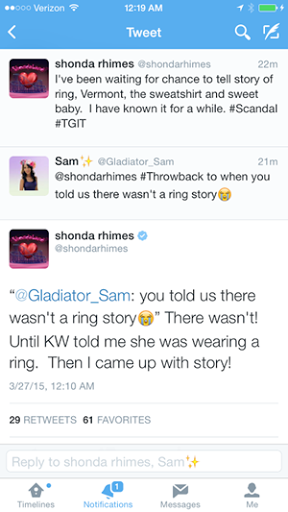 They told us they were going to explain the story behind Olivia’s ring. I briefly touched upon the ring here, but in order for today’s post to make sense, I have to start at the beginning. When I first watched the show, there were a few things I wanted to know more about, one of which happened in the very first episode. That episode title was “Sweet Baby” and it was called that because when Amanda Tanner told Olivia that Fitz had called her “sweet baby,” Olivia realized that Amanda was telling the truth – because she had personally heard this phrase from Fitz before. However, as viewers, we never saw him use that phrase and to me, it didn’t feel like it fit. At that point, we realized that the ring had a story. Then, Olivia was shown throwing the ring at Fitz out of anger, and she had not been wearing it since she took it off during her kidnapping (she left it behind as a clue to help her friends find it). Now, we’re up to this episode. The episode began by showing us that Olivia is still having nightmares related to her kidnapping. Interspersed with those, she has flashbacks to various moments with Fitz, starting when she met him and up until she threw the ring at him. The episode was also focused on Cyrus and his past marriages – first to a woman and then to James, the true love of his life. James and Cyrus were married after Olivia left the White House during the beginning of Fitz’s first Presidency, but before the events of the beginning of the series. 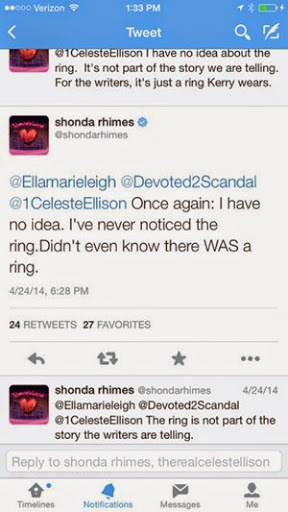 Which is why Olivia never had the ring in earlier flashbacks that took place before this one. 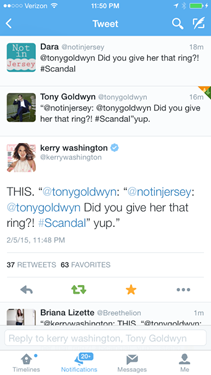 In this flashback, we see Fitz giving Olivia the ring. Not only that, but they are in Vermont, and he is wearing his Navy sweatshirt. 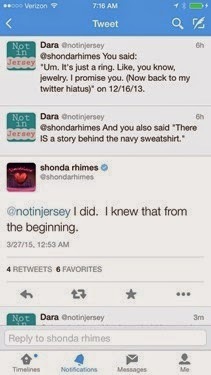 As seen above, Shonda told us there was a story behind the sweatshirt (the same one that Olivia picked up and cried into after Fitz had been shot). Olivia: “You want me to call a ring ‘sweet baby’? That’s right – we also got the meaning behind “Sweet Baby.” Everything was thrown all at once – even the song playing in the background was The Light, the Olivia and Fitz song that plays during their most intense and meaningful moments. 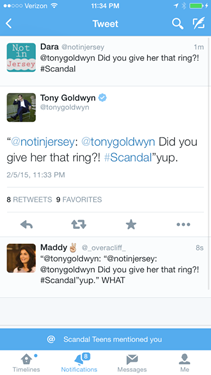 Later in the episode, Olivia goes to Fitz for help and he notices she is not wearing the ring. However, she has another dream and ends up searching for her discarded ring, and by the end of the episode, at Cyrus’s wedding to newest husband Michael, she is wearing it again. Really though? 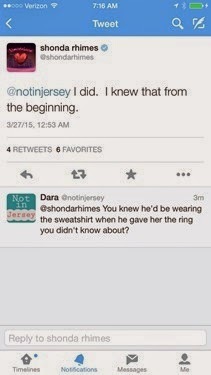 How could she have had a Navy sweatshirt story if he was supposed to be wearing it while giving Olivia a ring that Shonda never knew about? This interaction has almost taken away from my enjoyment of actually getting a back story for something I’ve been wondering about for over a year! Now that I’ve gotten it off my chest though, let’s look at this ring for a moment. To Fitz, Olivia wearing the ring means that she’s okay, she exists in his world. To her, it keeps her connected to him. She knows how he feels about it and she knows that seeing her with it on means something to him. Through everything, she’s never stopped wearing it. At this point in their (very messed up) relationship, Fitz is letting her be, not arguing with her, even complimenting her on how she went around him to plan Cyrus’s wedding with Mellie. With the space he gave her, she was able to put that ring back on. 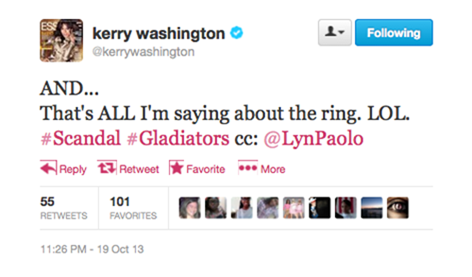 Olivia and Fitz obviously belong together. Now, I want to see them get there. We got the back stories, now give us our Presidential divorce!! 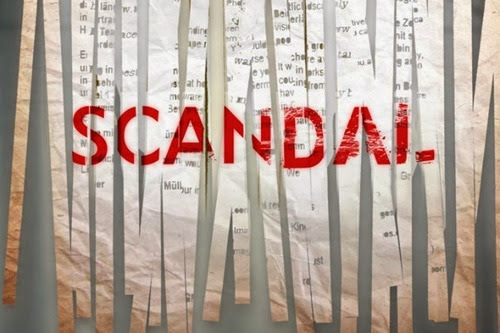 FYI: There will be no Scandal Sunday post next Sunday due to the Passover holiday. I have yet to decide whether I will post about next week’s episode either before or after the holiday, if at all.